We’ve talked at length about some of the myths behind open offices. Namely, the concept that employees are more productive and creative in an open workspace. What we’ve learned through experience and research is that the human mind needs some level of privacy – with both sound and sight – to feel safe and focus on work. “Feelings of helplessness” isn’t really what you imagined as the impact of an open office, right? So, when we saw a recent article from Harvard Business Review (HBR) about coffee shops being more beneficial for employees than open offices, we weren’t surprised. We were, however, quite interested in what the article had to say. Citing a few different studies, HBR said that researchers have discovered that background noise isn’t always a detriment. In fact, the source of the background noise is the determining factor in whether you’re distracted by the steady hum of conversation. Burkus also explored the idea that familiarity can be distracting; you know the people in your office, but the people in the coffee shop? Not so much. Hearing familiar voices and the names of people you know in a nearby conversation grab your attention. Even face-to-face conversations can derail your creative process and keep you distracted. Is it the Familiarity That Hampers you, or the Frustration? HBR’s conclusions are pretty solid. 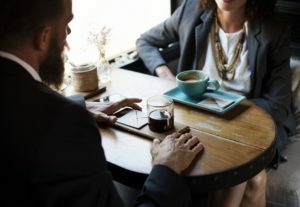 We do better at coffee shops and co-work spaces because we can’t really get drawn into conversations as we probably don’t know who’s doing the talking. In the office, it’s different. You know the voices, the stories and the people or incidents inspiring the banter. However, says Inc.com Contributing Editor Geoffrey James, it may not be the familiarity you have with your co-workers, but the contempt you have for them that distracts you. In an article in which he discusses the HBR article, James says you probably get distracted with the background banter because someone’s flaws are bubbling up amid the back-and-forth. “In short, it’s not the noise that makes an open-plan office such a miserable place to work – it’s the inability to escape the proximity of the petty and annoying behaviors of your co-workers,” James wrote. Another aspect of the HBR article we found interesting was that we work best when there’s just enough background noise to let our minds wander to creative places, but not complete silence. And that’s where our panel extenders come in to play. The products we offer install easily, look great and get the job done. Our panels have NRC and STC ratings (industry ratings for noise reduction) that significantly reduce the noise in each cubicle without eliminating it. If noise is a problem in your office and you don’t have the time or resources to do a complete overhaul of your current desk systems, stop by our website to learn about the solutions we have. Our panel extenders can be used in a variety of ways, come in multiple colors and materials, have three heights and eight widths and carry a 10-year warranty.